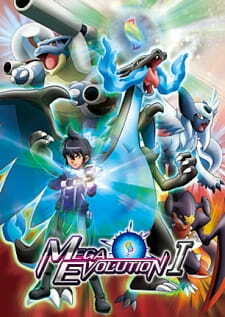 Previously an assistant of Miare City's Professor Platane, Alain and his Lizardon set off on a journey to become even stronger, by mastering the powers of mega evolution. Investigating the mysteries of this phenomenon, at the behest of the enigmatic Fleur-de-lis, Alain and Lizardon travel across Kalos and Hoenn in search of capable trainers who can use mega evolution in order to improve, as well as help Fleur-de-lis with his research. Along the way, they meet a young girl named Manon who, with her Harimaron, decide to accompany Alain, to which he reluctantly agrees. Pokemon XY: Mega Evolution follows Alain and Lizardon in their journey to become the strongest users of mega evolution, while also fighting against legendary monsters to protect the ambitions of Fleur-de-lis as well as the safety of those most important to him. Why isn't there any rewiew on this ani-spé ? I'm not used to write reviews but I need to do it for Pokemon. Pokemon The strongest mega evolution is a side story of the XY series that links it to the sequel "XY&Z" (and gives some fanservice for ORAS hype). It introduces a new main character, Alan, first dark and problematic main chara of Pokemon (laughs.). He used to be Prof Platane's assistant but began to travel on his own so that he can learn more about mega evolutions, and be stronger, that kind of things. I won't spoil too much but when he was a moment of hesitation, he made a crucial encounter and became able to himself use mega evolution. From this day, he works for the person who gave him his keystone and mega stone (anyway, anyone who played to XY knows who I'm talking about). I put 9 to the story because I was never bored. I watch it again and again and am never bored. Not "outstanding" because there's so much oras hype fanservice in act II and III but nevermind, it was still great. Nothing to say about the sound. I recognized most BGMs that are from the games, they're well chosen and the always nice sound of pokeani is one of the reason why I can't get bored of Mega Evolution (Alan's flashback in Act I with "the sun shines down" music is peace of art). For the characters, 9... Dunno. I love Alan, he's adorable and all, but he's stupid. Please get out of that teenage rebellion already. What I still haven't talked about and is central in the story is Alan's companion, Manon. She's the only character in this story who's able to tell things as raw as they are, when she's happy, angry, or when she was trully scared. Truly said, without her around that idiot Alan would be dead meat now. If there were only those two I would put 10, put I'm a bit disappointed that Platane and Furadari didn't know each others like they did in the game. So -1 payback. I already said enough how much I enjoyed these specials. For the overall, there are this I can criticize but it really deserves a 10 as it perfectly does what it has to do, introduce the Flare-dan intrigue. And many people say that Alan is the best thing that ever happened to Pokemon, I must complete by saying that Alan with Manon by his side is it. Those two are shining stars. I'm eager to see those two again in the main anime sequel ! Notes: Pokemon's first season was pretty great back in the day, and then the series went down hill from there with it's copy-paste animations, mediocre voice acting and recycled plots. BUT! The old guard has been fired, and the new production company (Production I.G. YES the exact same people who did 'Attack on Titan') have gotten things back on track, and now I can proudly say: Pokemon isn't just good again, it's great! Now with actual character development, Sakuga quality animation, an overarching plot that makes you yearn for the next episodes! There's still filler, but even those make Naruto envious now. It's not going to exceed the other series I named on the list, but it is without a doubt worth the time to watch now. If you want to watch Pokemon, I recommend you watch the first season, then hop on over to XY and the Mega Evolution specials.